of 2012 by the American Library Association. This collaborative anthology features the wisdom of more than 30 diverse multigenerational women exploring how their spirituality nurtures and informs their leadership in the world. 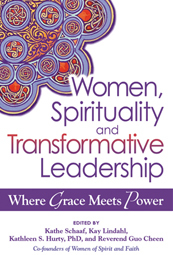 We invite you to join us on this journey as we explore the creative connections between women, spirituality and transformative leadership. Kathe Schaaf weaves together her years of experience as a teacher and writer,as a non-profit director and a psychotherapist, as a mother and a community organizer, with her passion about the value of women to the world. Kathe has been bringing leadership to a unique series of conversations at the intersection of women’s leadership and feminine spirituality for more than a decade. © Kathe Schaaf. All Rights Reserved.